Below you can find answers to commonly asked capitalization questions. If you want a question featured here, feel free to contact us and we may include it! 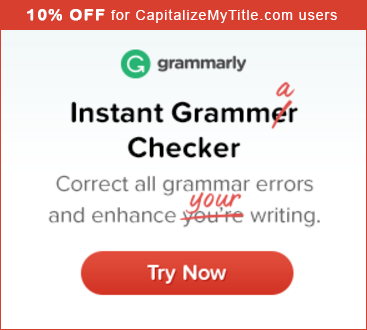 Grammarly has made installing their free Grammarly chrome plugin extremely simple. All you need to do to install the Grammarly Chrome plugin is follow the steps below. If you want to learn more about why we recommend Grammarly, read our Grammarly review. Go to Grammarly’s website to get access to the Grammarly Chrome plugin. When the popup opens that asks whether you want to “Add ‘Grammarly for Chrome,'” click “Add Extension. Make sure that the Grammarly logo appears in the top-right corner of your Chrome browser. Many people often wonder why or even whether there is an apostrophe in Father’s Day. There is an apostrophe in Father’s Day andthe reason is quite simple. Father’s day was meant to celebrate the contribution of a father to his family. Father is not meant as a collective group here. It is a not a day to honor all the fathers in the world. It is a day to celebrate each father as an individual. This is why the apostrophe is after r and before s, so that it indicates that the father is an individual. If the apostrophe was after s, then the meaning completely changes. For example, April Fool’s Day is a day for all the fools of the world. That is why the apostrophe is after L. If Father’s Day were spelled Fathers’ Day, then the holiday would refer to a day for all the fathers in the world to celebrate together. This is why you will see that people wish Happy Father’s day to their father only and not to everyone. It is different from other popular days like Christmas Day, where you wish everyone. What’s the difference between hanged vs hung? The main difference is that hung is used when referring to inanimate objects while hanged is used when referring to people. You can read more about the differences in our article on the differences between hanged vs hung. Sentence case is a style of capitalization used by many of the popular style formats including Chicago, MLA, APA, and AP. To use sentence case capitalization, you should only capitalize the first word of a sentence and any proper nouns. 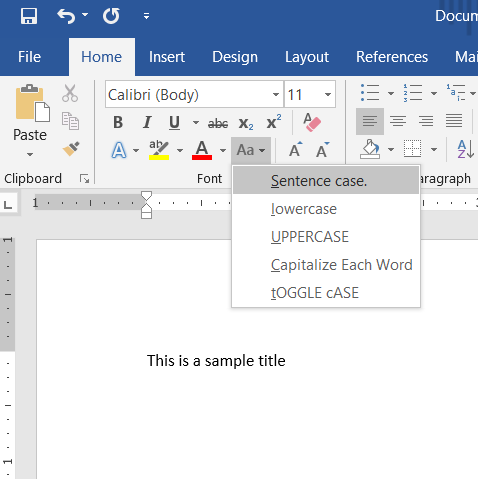 Our free title capitalization tool has the option for sentence case for each capitalization style so you can quickly format a title in sentence case. Sentence case is the preferred headline capitalization style for newspapers and online journals in the US and UK. It is sometimes referred to as “down style” and “reference style.” In fact, if you go to CNN.com right now, I bet you’ll see all of the headlines in sentence case. The word governor often confuses people when it comes to capitalization. Is it governor or Governor? When do you capitalize it? The word governor can be a proper noun or a common noun depending on the context in which it is used. The governor will announce his candidacy this morning. Dan Malloy was not a great governor. According to English capitalization rules, proper nouns are always capitalized. Therefore, when referring to a person with the title Governor, always capitalize the word. For more title capitalization questions, use our free title capitalization tool here. The word mayor often confuses people when it comes to capitalization. Is it mayor or Mayor? When do you capitalize it? The work mayor can be a proper noun or a common noun depending on the context in which it is used. The mayor will announce his candidacy this morning. Michael Bloomberg was a great mayor. According to English capitalization rules, proper nouns are always capitalized. Therefore, when referring to a person with the title Mayor, always capitalize the word. What about mayoral? Should mayoral be capitalized? Memorial Day is a federal holiday in the United States of America to celebrate the remembrance for those men and women in the military who passed away for the victory of the nation. Yes, Memorial Day is capitalized when used in a sentence because it is a proper noun referring to a holiday. Wearing symbols like red poppy also signifies the day. The word day is capitalized because it is part of the holiday as it’s observed in other holidays. Memorial Day is a national day for respected heroes who died in the country. The holiday always falls on the last Monday in the month of May. Besides, It’s celebrated every year. Memorial Day is celebrated by raising the US flag and lowered to half staff and then brought to a full-height in the afternoon. It was first proclaimed on 5th May 1868 by General John A. Logan after the Civil War when it was first known as Decoration Day. Most people nowadays look at it as a recreational day when they get off from work or school, but it is important to reflect on the suffering and loss by those who served to protect America’s interest. It depends. If you are referring to a specific job title such as “Head of Digital Marketing” then you should capitalize the job title with regular title capitalization rules since it is a proper noun. However, if you are referring to a general job title in a sentence such as “program chair” in the following Objective Statement: “I am seeking a position as a program chair,” then you should lowercase the job title. For more help with capitalizing job titles and other resume sections, refer to our guide on resume capitalization. Yes, Good Friday is capitalized because it is a proper noun and a named holiday. Even though Friday is always capitalized since it is a day of the week, Good is capitalized in this case as well since the two words together refer to the religious holiday that comes two days prior to Easter. Good Friday is a Christian holiday commemorating the crucifixion of Jesus three days before he rose again. Yes, Ash Wednesday is capitalized because it is a proper noun and a named holiday. Even though Wednesday is always capitalized since it is a day of the week, Ash is capitalized in this case as well since the two words together refer to the religious holiday marking the beginning of Lent which precedes the Easter celebration. Yes, Lent, when it refers to the season leading up to the Easter holiday, is capitalized because it is a proper noun and a named holiday. When the word refers to giving money to someone, then it is lowercase unless used in a title. Easter is a religious holiday of the Christian faith celebrating the rebirth of Jesus Christ after he died on the cross. Lent marks the 40-day period prior to Easter which begins with Ash Wednesday. Yes, Easter (and Easter Day) is capitalized because it is a proper noun and a named holiday. The word “day” is capitalized when used right after “Easter'” since it is part of the holiday name. Easter is a religious holiday of the Christian faith celebrating the rebirth of Jesus Christ after he died on the cross. Other holidays associated with Easter include Lent, Ash Wednesday, and Good Friday. Generally, yes. If you are referring to the Catholic Church, then “Catholic” and “Church” should be capitalized since they refer to a proper noun. If you are referring to someone who practices Catholicism, then you should capitalize Catholic as well. When would you lowercase Catholic? When it first entered the English language in the 16th century, catholic meant “common” or “general” so the religion was naturally the “common” religion. When the Western Church split from the rest of the church after the Reformation, it began referring to itself as the Catholic Church, but the word catholic still meant “general” or “common” when used by itself. Since Catholicism is a noun referring to the Catholic religion, it is capitalized as well. No, seasons are not generally capitalized. We always capitalize days of the week and months of the year in writing. However, when it comes to seasons of the year, we don’t capitalize the name of the season. If we did, we would have to capitalize every particular time period, even those occurring throughout the day, like morning and afternoon. This would look absurd and get quite confusing. Seasons, such as fall, spring, winter, and summer are general nouns, not proper nouns so therefore seasons shouldn’t be capitalized. Days of the week and months of the year are proper nouns instead so they are always capitalized. Therefore, the capitalization that applies to proper nouns isn’t applicable to seasons. Another example is when seasons are personified in a piece of creative writing, such as in poems. But this only applies when seasons are given life in such writing. Overall, the general rule is that we don’t capitalize seasons, fall included. Yes. The Supreme Court is capitalized because it is a proper noun referring to a governmental judicial body that oversees the law of the land. This includes the highest court in each state, such as the California Supreme Court. However, when referring to generic supreme courts, such as in this sentence, you do not need to capitalize it. What about capitalizing the word court? Is the season fall capitalized? No, the word fall is not capitalized and neither is the word autumn. We capitalize days of the week and months of the year, but when it comes to capitalizing seasons, the rule is, we don’t capitalize them. If we did, we would have to capitalize every particular time period, even those occurring throughout the day, like morning and afternoon. This would look absurd and get quite confusing. Fall, being a season, is a general noun. Therefore, the capitalization that applies to proper nouns doesn’t apply to fall so the season fall is not generally capitalized. Another example is when its personified in a piece of creative writing, like in poems. But this only applies when fall is given life in such writing. December is that unique month where people do celebrate a wide range of holidays. One of the obvious tasks that most people will be engaged in will be to send their loved ones greetings and best wishes. It has become a common norm for many to use the phrase “Happy Holidays” when sending greeting cards or wishing someone well during the holiday season. Why? The obvious reason for this case is because people want to wish their loved ones the best in the many holidays that they will be celebrating in one go. celebrating such as Christmas, New Years, and Hanukah. It is therefore common practice to capitalize the phrase since people have come to accept it. Even though the word “Holidays” isn’t a proper noun, it’s used in this phrase to replace the many of the holidays people could be celebrating such as Christmas, New Years, and Hanukah. It is therefore a common practice to use the phrase as it is since people have come to accept it. This is because these nouns are proper nouns that refer to the holiday specifically. The rule of capitalization, therefore, is that their first letter is capitalized. Day, Mother’s Day or Valentine’s Day, national holidays that commemorate national events such as Independence Day and Martin Luther King Jr. Day in the United States. This rule is also observed for religious occasions such as Lent, Advent and Christmas day for Christians, Ramadhan for Muslims, and Hanukkah for Jews. Holiday names are special nouns that are unique and thus they are not common nouns. In grammar, it is therefore prudent to capitalize them to emphasize their importance and uniqueness. During the holidays, the use of new year vs New Year gets confusing for most people and this should never be the case. It is important for everybody to have the right knowledge of the proper capitalization of both holiday terms and holidays in order to avoid embarrassment when sending out holiday greetings. The short answer is that New Year (and Happy New Year) are capitalized. This a very common question especially for teachers just before schools break for the holidays. It is also a conundrum for anyone who sends out holiday cards. The distinction between new year and New Year depends on whether the reference is being made on the year or the holiday itself. If a reference is being made on the holiday, then it should be capitalized e.g. Happy New Year! However, when someone is making reference to the year itself then it should not be capitalized e.g. It is the second day of the new year. It is grammatical and customary to capitalize both secular and religious holidays. In addition, when the words eve and day constitute the holiday name then they should be also capitalized. This is regardless of whether the name of the holiday is shortened or not e.g. New Year’s Eve. One easy way to remember is never to capitalize in instances when you are using an article such as the or a. So, is new year capitalized? It depends on how it is being used. Hopefully, we have cleared up any confusion that might exist when sending out holiday cards to your friends and family. Spread the word on when New Year is capitalized and help everyone to ring in the new year correctly. You have already written holiday cards and are now ready for dispatch, but you decide to, first, double-check your use of capitalization. So, do you capitalize Merry Christmas? Well, yes! The reason is, unlike the word holiday, which does not refer to any officially elected day but rather the entire season, Christmas Mass is the official name of a characterized religious holiday. So, provided you are writing it as a proper noun, and as such refers to a specific day, Merry Christmas capitalized, should appear on all your cards. When you combine the words such as day and eve with the holiday name, make sure you capitalize Christmas and the accompanying words. Note that shortening the holiday name does except it from capitalization because they still refer to specific events in the region’s history. In the same way, always capitalize proper holiday nouns such as New Years’ Eve, Thanksgiving (celebrated in The United States), Halloween and Boxing Day (observed in the United Kingdom) and other similar terms. When, for instance, you are referring to an individual being merry on that particular day you don’t capitalize the complimentary word. So, telling someone to have a happy Christmas (without caps in the adjective) is grammatically correct. Your use of the adjective joyous is not unique since you could as well have chosen any other words with the same meaning such as happy, merry, festive, sober and so forth. However, Christmas has to be in caps because even in the sentence it refers to a designated occasion. Merry Christmas is always capitalized because Christmas points to a particular day and hence is a proper noun. The accompanying adjective is also a part of the command. So, make sure you get it right any time you use it. The short answer is yes, the Fourth of July is capitalized because it is a special date, a holiday. You should capitalize the “Fourth” and “July,” but lowercase the “of” because “of” is a short word. If you are referring to the Fourth as “Independence Day” then it should also be capitalized since again it is a special date. 1. When talking about age (for people and animals), numerals are used. E.g. Jason is 17 years old. 2. Single digit numbers (less than 10) should be spelled out. E.g. The American Flag has 50 stars, but only three colors. On average, Americans have four beers during Independence Day celebrations. E.g The Fourth of July Celebrations just began. The third rule is especially important. We can always say Fourth of July, July Fourth or July 4. It is however grammatically incorrect to say 4th of July. The word earth often confuses people when it comes to capitalization. Is it earth or Earth? When do you capitalize it? The confusion arises because Earth can be either a proper noun or a common noun depending on the context in which it is used. If Earth is used as a proper noun, then it is capitalized. If used as a common noun, then the word Earth is lowercased. The Earth takes about 365 days to orbit the Sun. In this case, both Earth and Sun are proper nouns so they must be capitalized. The construction workers dug into the earth at the site of the new skyscraper. It is important to remember that idioms using the word Earth also have to be lowercase such as in: down to earth, what on earth, and four corners of the earth. These are cases where earth takes the definite article so it should not be capitalized. For other capitalization questions, check out our FAQs or use our free title capitalization tool. Yes, Father’s Day is capitalized when referring to the holiday. Reason #1: While Father’s Day is not an official federal holiday, it is considered to be one of the most common celebrations, like Groundhog Day and April Fools’ Day. That’s why it is always capitalized. I) My father is not well. – Here the word ‘father’ has been used as a common noun and it isn’t capitalized. II) I have planned to celebrate Father’s Day on 18th June. – Here the word ‘father’ has been used as a proper noun. Thus, it is capitalized. Reason #2: Father’s Day is widely celebrated to honor fathers as individuals. This is the day when the children portray their sincere respect and gratitude towards their fathers. This day is special and unique to every father. Considering its significance and importance, the term Father’s Day is capitalized. The short answer is no, spring is not capitalized. Seasons are considered as common nouns and as a general rule of capitalization, they are not capitalized when used in writing. This rule applies to all seasons, including spring. Apart from these three exceptions, the word spring should always start with lowercase. The most common mistake that people make when writing the names of the seasons is getting confused about the capitalization but these rules will help you write it correctly. Apart from these three exceptions, the word spring should always start lowercase. The most common mistake that people make when writing the names of the seasons is getting confused about the capitalization but these rules will help you write it correctly. The short answer is no, the word “summer” is a generic noun which does not require capitalization as per rules of capitalization. This rule applies to the names of all the seasons. You do not capitalize seasons when used in writing. This rule has an exception when the word is used in a title, is used as a proper noun, or is the first word of a sentence. When you start a sentence with “summer” or are using it in a title, it should be capitalized. If you use summer as a proper noun, such as in “Summer Semester,” it must also be capitalized. Another exception in which you should capitalize summer is when it is personified in poetry. Apart from these exceptions, there is no need to capitalize seasons, including summer, for any writing purposes. So, the next time you are confused about capitalization rules for seasons, read these rules carefully to avoid writing summer capitalized in the wrong places. You should not capitalize the word winter since it is a common noun and not a proper noun. But there are obviously a few exceptions where one has to capitalize the word winter. When winter is used as a title or when it is used at the beginning of a sentence (such as “Winter is Coming”) are two examples of when winter should be capitalized. Also when winter is used as a proper noun it should be capitalized. Winter can also be capitalized it when it is personified such as in a poem. The word winter does not necessarily need to be capitalized considering it is a generic noun. People normally confuse this word for a proper noun and capitalize it based on it being a proper noun. Generally, the word winter should not be capitalized. The temperatures are usually low during the winter season. When the word winter is used like a title one will have to capitalize it since it is a rule to capitalize titles. “Winter” was included in a title and we must follow title capitalization rules and capitalize it. It is a rule in the English language that proper nouns have to be capitalized, so when using the word winter as a proper noun you have to capitalize it. The Winter Gala is an event held every year in December. In this case “Winter Gala” is the name of an event so “winter” is part of a proper noun. Therefore it should be capitalized. Generally, you should capitalize the word “world” when using title case (Chicago, APA, AP). However, if you are using sentence case in APA, you should only capitalize “world” if it is the first word in the sentence or is part of name (such as “World Wide Web” or “World Wildlife Federation”). Yes, according to all English title capitalization rules, you must capitalize the holiday title. This includes both holidays where businesses are closed as well as church holidays. If the holiday contains multiple words, all words should be capitalized in the title. For example: New Year’s Day. Even if the holiday is shortened, such as in “New Year’s,” both words should still be capitalized. Hyphenated words are complicated and depend on which style you are using. You can find the rules for hyphenated words for CMOS and APA below or you can use our free capitalization tool. Capitalize the first and second element of a hyphenated phrase. To automatically capitalize your titles with the correct rules for hyphens, try our free capitalization tool. Yes, Internet should be capitalized whenever it is used. You can read more about how to capitalize Halloween in this article. What are the different rules for title capitalization? Hanukkah is a popular Jewish holiday and since it is a proper name for a holiday, the word is capitalized when used in writing as per the rules of capitalization. The word Hanukkah is capitalized but the word “holiday” is not capitalized as in “Hanukkah holiday” since it is not a proper name. You should capitalize Hanukkah in holiday cards or wishes and all proper holiday names as well. It is very common to make this capitalization mistake but the right expression makes your wishes and cards seem professional and correct. Hanukkah is also spelled as Chanukah in some parts of the world but both the words are names for the same holiday. So the next time you start writing your holiday cards or wish someone in writing, make sure it has the word “Hanukkah” capitalized. Hanukkah is also spelled as Chanukah in some parts of the world, but both the words are names for the same holiday and thus both should be capitalized. So the next time you start writing your holiday cards or wish someone “Happy Hanukkah” in writing, make sure the word “Hanukkah” is capitalized.